DataSpace are the Document Management provider that takes security to the next level! DataSpace’s secure offsite storage facilities are located within a enclosed paladin fenced 4 Acre site that is monitored by online CCTV 24/7/365. DataSpace is also compliant and accredited to BS5454, and are registered with PCI DSS, the ICO and the NHS IG Toolkit. Additional security features of DataSpace’s purpose built Storage Warehouses are that they are completely unbranded and we are on urgent response with the local emergency services. BUT…. if you need even more protection for your items. DataSpace provide the ULTIMATE protection unit for your items – our 4 Hour Fire Rated Vaults. You might require Fire Rated Vaults for documents vital to the running of your business, alternatively it might be needed for your clients records for example wills and deeds. 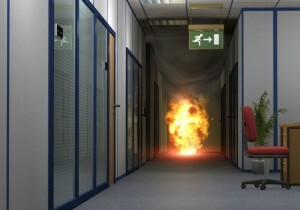 DataSpace’s Fire Rated Vaults are available for all business sectors and all types of documents. Our Vaults can also be utilised for other items that aren’t documents, such as artefacts, tapes or any other items that need to be stored in a Fire Proof environment. DataSpace Fire Rated Vaults are fire insulated inside and are made from a specialist Promat fire rated Durasteel. DataSpace’s secure Fire Rated Vaults can store up to 400 A4 Archive Boxes and can be hired by one individual client or can be shared. An additional benefit to using DataSpaces secure Fire Rated vaults is that if do require an item back DataSpace can scan and host your document within your required timescale to BS10008 standards. This means that the scanned copy is of such a quality that it is legally admissible in a court of law if required. Using DataSpace’s Scan on Demand services rather than having the document physically returned reduces your company’s carbon footprint as well as reduces the risk of degradation of the documents and preserves them electronically for future use.